The New Years Projects for preschoolers and toddlers have been hand-picked to be sure they are appropriate for even the littlest hands to be able to participate in finishing the project. Fold the paper plate in half. Pour approximately 1/3 cup of dried beans in the center. Cut small strips of colored electrical tape or other strong tape to seal the beans inside the paper plate. Cut several different colors of tissue paper into small squares. 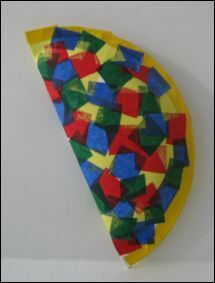 Spread glue onto the paper plate and then overlap tissue paper squares on the glue. Spread another thin layer of glue over the top of the tissue paper. Let dry.